Improperly watering orchids is probably the cause of more orchid deaths than any other reason. 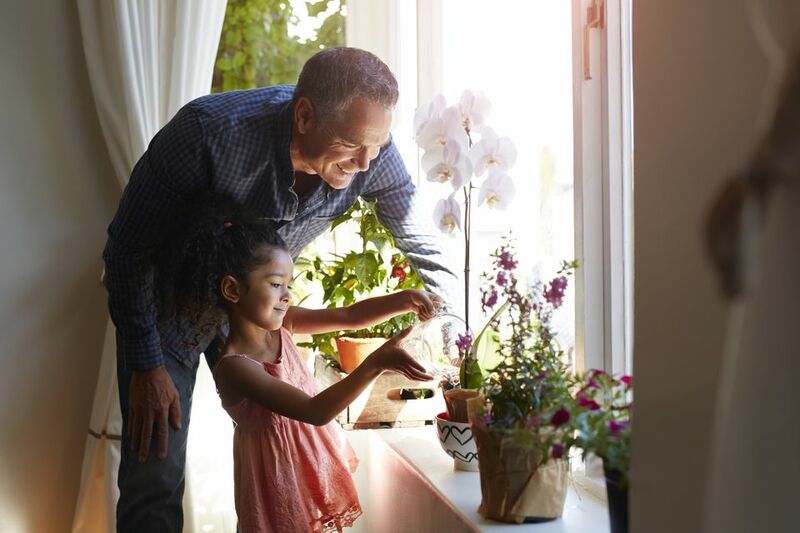 Watering orchids is not complicated—there is no secret handshake, no lunar cycles involved—but it does require a different mindset than watering regular houseplants. And it requires a basic understanding of how orchids work. The vast majority of orchids grown in the home are epiphytes, meaning they live in nature by clinging to trees or even stones. The roots of these plants are highly specialized organs that differ dramatically from normal plant roots. Of course, it's hard to generalize about anything when it comes to orchids. This is the single largest group of plants in the world, so for every rule, there are 100 exceptions. For the rest of this article, the focus is on epiphytic, tropical orchids. In general, it's best to follow the guidelines for each species when it comes to individual watering practices. Orchid roots are surrounded by a tissue-paper thin membrane called velamen. This multi-purpose membrane soaks up large amounts of water quickly, adheres to rough surfaces, and promotes the exchange of minerals and salts. Like an expensive water meter, orchid velamen is an excellent indicator of your plant's water needs. Dry velamen is white or silvery, and freshly watered velamen is green or mottled (depending on the species). Learning to read your orchid roots is the best method to getting watering right. Remember: most orchids would rather being slightly under-watered than overwatered. Orchid roots that are kept constantly wet will rot, and the plant will decline. Orchids are tropical plants, right? So they like lots of water, right? Sort of. Many popular orchids are tropical plants, but they are tropical plants that live in trees. In their natural habitat, they are exposed to drenching rains that may last hours or even days, but many species are also adapted to a dry period where little rain might fall for weeks. Orchid plants should never be allowed to sit in still water. In many cases, the plant should completely dry between waterings. No matter what kind of orchid you grow, always water in the morning. Always. Nighttime watering allows water to stagnate in the growing tips of phalaenopsis or the flower sheaths of Cattleyas. This encourages bacterial and fungal diseases. Orchid plants should be absolutely dry heading into the night. Orchids are pretty good about telling you what they need. During the growing season, pseudobulbs should be fat and plump, and fleshy leaves should be held up off the potting media and thick. Some deciduous orchids might shrivel during the winter. This is fine. Know what you're growing. As previously mentioned, it's hard to generalize. It's always best to follow the rules for your particular plant. There are, however, some best-practices that will greatly increase your chances of success. When you do water, do it like you mean it. Different growers have different rules, but many professional growers turn on their sprinklers for 8 or more minutes. Successful home-growers sometimes dunk their plants, pots and all, into a bucket or sink of water. Some varieties, such as vandas, can be left floating in water for a surprisingly long time. The idea is to make sure the velamen is completely saturated. You want tiny droplets hanging on the roots after watering. This means the plant is completely hydrated. For a long time, serious growers insisted that orchids could only be watered with rain water. Nowadays, most people just use tap water, and this is fine. I've been using tap water for almost 10 years with no problem. However, be aware that treated water may have higher salt content, and some water is high in calcium. If you see deposits forming on your plants, you should seek out a new water source. If you're not sure if you should water your orchid or not, hold off. Again, there are some species this won't work for, for instance, paphiopedilum and phragmipedium. By the time they look thirsty, they should have been watered yesterday. But most potted epiphytic orchids would rather be on the dry side than overwatered. Potting media. Different potting media retain different amounts of water. Pine bark nuggets will hold a water longer than charcoal or clay pellets. The greater the water retention, the less you need to water. Mounted plants will need more water. Species. Make sure you are familiar with your particular species and following its rules. Different orchids can have very different watering requirements, and it can be very challenging to have a mixed collection without overwatering or underwatering at least some of your plants. I'd start with just one or two favorite varieties. Temperature. The higher the temperature, the greater the need for water, in general. Humidity. In general, the greater the ambient humidity, the less need for watering. Humidity is closely related to what kind of potting media you are using. Many home-growers keep their pots in a tray of pebbles filled with water to increase local humidity. Air flow. Don't be afraid of a little air flow. Orchids like plenty of fresh air, both around the roots (for mounted plants) and leaves. But greater airflow tends to dry them out quicker, so you'll need to increase watering.